It has been as ever, a year showing wide variation, internationally and nationally. With there being 151 library services in England alone, it could hardly be otherwise. However, having read everything UK public library related over the last year, here are my key themes. The fight for library buildings has (sort of) been won but the fight for adequately funded library services has never looked so fragile. Councils just aren’t closing many libraries: Cipfa estimated just 49 (1%) closed in 2013/14, 74 the year before. That’s a lot less than most people would believe. It shows that councils realise the tremendous detrimental political impact of closing a library. However, this is not to say that we should all be celebrating because, faced with massive cuts from central government and strong pressure not to increase council tax, councils are cutting libraries in other ways. The obvious one is to replace paid staff with volunteers, and that trend has only been growing this year, but other ways include cutting bookfunds (down to its lowest level for decades), When you see a flagship mega building like the Library of Birmingham having its opening hours cut almost in half, you know times are tough. Times are looking good for new English library trusts – Although Wigan are taking library services back from the trust there, overall there’s never been as much pressure on councils to divest library services. Suffolk and York are being touted, most recently in the Sieghart Independent Report, as the great new hope … and the benefits they bring in terms of reduced costs are being scrutinised all around the country. In Scotland, where slightly different rules apply, trusts now commonly run libraries: expect a flood of these south of the border in the next couple of years. A lack of amalgamations. There’s been a surprising lack of different councils merging library services for economies of scale. Perhaps there’s a strong element of turkeys not voting for Christmas in this one. It is notable that GLL are eyeing at least one more service but no-one has yet publicly announced they’re doing another Tri-Borough. Private companies failing to make a dent – The US private library company, LSSI, has failed to pick up a single library service in the UK while Carillion – who bought out Laing last year with weeks of the latter taking over Croydon – have failed to expand. There are suspicions that challenging councils in, for example, Lincolnshire is opening the door for private companies further down the line (the reasoning being that they can competitively tender against trusts etc) but there’s been no actual sign of this yet. One to watch, though. Usage falls as funding falls – Usage in England continues to fall roughly in line with reductions in funding, but usage in the US, Wales and Australia and other countries is stable or is increasing roughly in line with increases in funding. The evidence is there that you get what you pay for: if you fail to fund libraries adequately then the public notice and cease coming meaning you get less customers and there’s more reason to reduce funding, The vicious circle is there for all to see. Dark times continue to be ahead – Both main political parties are committed to austerity and thus further cuts to council budgets until 2020. Neither are willing to protect libraries from those cuts which means that you can expect, if anything, deeper cuts in the sector in the next parliament than this, certainly if the Conservatives win. If Labour win then there is a chance their cuts will be less draconian but it is unlikely to feel better at the time. We can hope, though. Protest works. The success of the judicial review in Lincolnshire and of protests in Liverpool and Wales show that, actually, the key thing to protect your library is to protest cuts. Simply using the library more has some impact but there’s been enough examples this year of well-used libraries going under threat to show that it’s not key. Indeed, a well-used library may even be more at risk as the council thinks volunteers would be more likely to save it. No, the key thing to keeping a library open is the presence of loud, well-organised protest groups. This is going to be especially obvious until the General Elections next year but then expect it to be lot less important as politicians get down to the dirty work: the loss or not of judicial review (still going through parliament) will have a great bearing on whether local people are listened to or not in non-election years. National Libraries Day gaining acceptance. Most library services ran at least one event in 2014 and I expect only the most reactionary and cautious councils to ignore it in 2015. From its roots a few years ago as an instrument of protest, the Day is becoming used as an important advocacy tool locally and nationally. A good thing to see. Similarly, the launch of the Library A to Z, crowd-funded largely by campaigners, has also gained widespread support in many public libraries – probably because it is very carefully apolitical and concentrates on the positive rather than the negative. National organisations are upping their game. Although those going through PLUIO (Public Library Universal Information Offers) training may not appreciate it, because the online modules are sometimes cloggy and mind-numbingly tedious, the SCL have tried their best to make an impact on local councillor views and nationally. The same can be said to some extent of CILIP who have been active, with Big Debates and other stuff, this year. The professional association’s obsession with navel gazing – sorry, modernisation – has also now apparently come to an end and has, at least, left the organisation on a firm financial footing. Praise must also go out to the Carnegie UK Trust who have put their back into the LibraryLab innovation grants, leadership training and their advocacy work. Great to see. Angus – Libraries may move into a Trust, with leisure and culture. Haringey – Muswell Hill Library may move location, one member of staff to be lost. Lancashire – Burscough Library may move into station building. North East Lincolnshire – Laceby Library has closed (may be taken over by parish council/volunteers). Stockton – Roseberry and Billingham libraries merged into new combined library/customer service centre in Billingham. Roseworth and Thornaby libraries moved into children’s centres. Public Health Information Library has also moved into Redhill children’s centre. Major refurbishment in Norton Library has now finished. Beacons – small transmitters that push information to users in a small area (e.g. storytime information to those entering the children’s library) and pull information about visitors (e.g. to track who moves where in a library). Merry Christmas everyone. Here’s to a better 2015. I often get asked how I find the time to do Public Libraries News. For any of you who don’t know (and I deliberately don’t emphasise this on the blog for reasons all of you will be able to guess) I do have a full-time job as a librarian and, yes, I also have a family that demands full attention as well. The answer therefore is that PLN is my leisure time. Before, you see, I would slob out in front of TV or play computer games (strategy games mainly: I don’t have the quickest of reflexes) and now in some ways I have simply contributed one form of computer activity for another. But of course this is far more rewarding than any computer game: this blog appears to actually be useful to people and does, in its small way, hopefully, help public libraries and library workers. Being able to understand what is going on and to get the chance to know or at least meet many of the major characters involved are also bonuses. And if you do something you enjoy you find the time to do it. It helps also to have a supportive and long-suffering wife and family (my youngest child, who is eight, cannot remember me without the blog) as well. So PLN, I guess, is now part of me and it’s got to the stage now when I’m not sure what I would do without it. Thanks to all of you for supporting the website. Do please keep sending me your news and views. Let me know if you want a particular topic covered or if the views expressed herein are simply wrong. PLN depends on knowing what is going on and that involves on knowing all sides of the argument. A correction or an opposing viewpoint is not an offense to me: rather it is a vital gift. So, please, may I take this opportunity to wish you all – even in these dark times – a very merry Christmas and a happy, a better, 2015. Keep on with your good work and remember to enjoy, celebrate and continue to fight for public libraries. Barking and Dagenham – Valence and Thames View Libraries under threat. Birmingham – £1.5m cut 2015/16, to be cut by £4m by 2018 (40% cut). Library of Birmingham cut from 70 to 40 hours per week. Petiton. Gwynedd – 8 libraries to close or be passed to volunteers (from Bala, Bethesda, Criccieth, Deiniolen, Harlech, Llanberis, Nefyn, Penrhyndeudraeth and Penygroes). Vale of Glamorgan – Rhoose Library under threat. West Dunbartonshire – Libraries will be passed to WD Leisure (£457k cut). Wirral – 15 libraries will be reduced to 18 hours per week. 7 out of 12 remaining librarians to be made redundant. Management of library staff transferred to One Stop Shop managers. 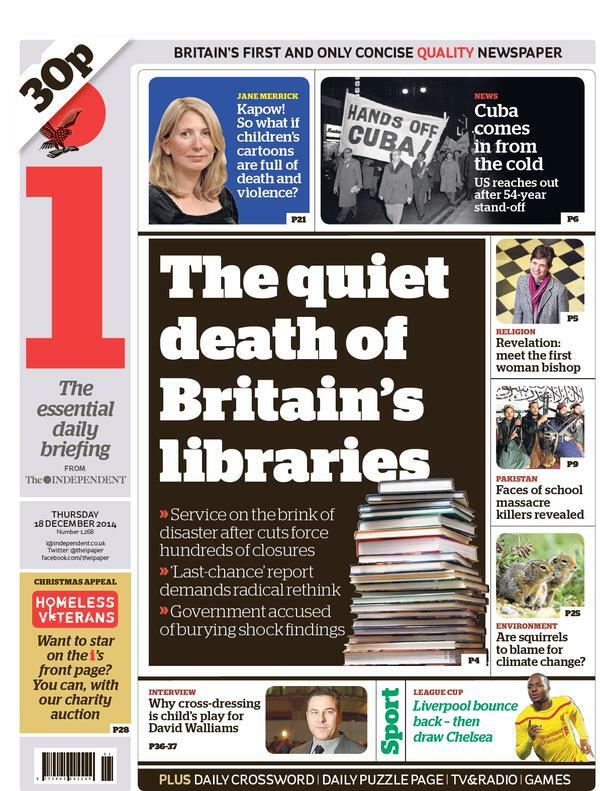 “The quiet of death of Britain’s Libraries” I – Front page headline. The description of public libraries as a golden thread that is present throughout people’s lives is what will stick with me from this report but I am unsure what else will, for this appears to be a report written with the current government and politics in mind. Sieghart knows that the Coalition is not going to accept a report that requires large amounts of money or goes against the doctrine of localism so he looks at what is needed and tries to pull the appropriate lever. Need investment in getting new computers? Go for pushing the digital by default agenda and very carefully avoid giving a figure for anything. Frustrated by the lack of central direction? Get together all of the current leaders in libraries, along with digital people (two birds, one stone) and give them priorities and times scales. As such, one way of viewing the report is to admire the Machiavellianism of people working out what is needed and couching it in terms that are acceptable to the decision makers. You can see the whole thing as being written in a careful code, tiptoeing around the reality of dire budgets and an increasingly atomised and demoralised service in order to try to keep something alive for better times. Indeed, one wonders why the Government, normally completely ignorant of subtlety, appears to have deliberately buried this key report on public libraries on the very last possible day before Christmas. An opposing view of course is that this committee has been packed with people who think like the Government does. Such a viewpoint would note that Ed Vaizey will not be choking while sat on his antique furniture over this one. Indeed, the Report appears argues what he does, that massive cuts to public libraries can somehow be squared with a thriving service, that 151 local authorities will somehow be more efficient than a regional or national service and that best practice and nudging will do the work that in other countries require national strategy and direction. The Report thus misses the chance to make a big statement or a big headline and, one worries, a big impact. There’s no mention of standards or the possibility of them, which is a great shame as that is one thing that could make a change and, although there’s no way Vaizey would have gone for it, there’s another party out there and a general election in the offing. Let’s face it, if the Conservatives get in next time then libraries as we know them are gone. The worry is that Labour will read this report and do too little to change. Or it may be the committee believes that both parties are effectively the same (and there’s so little between them in so many things they may not be wrong) and so it’s time to get used to the new order, salvaging what one can. The message that the media has taken away from this is that libraries should be like cafes. But the country already has cafes. What libraries are, can be and should be for the future health of the country is so much more than that. To their credit, the committee does show their awareness of this many times but the media appear to have gone for the simple lowest common denominator description. So what do I believe? I think that this report is fine and the hard work that went into it is worthy of praise, however faint it may sound. It’s frankly hard to argue with too much of it and what there is, if it happens as suggested, will change things for the better. But I also believe that it misses the chance to make big points. It is just another, despite its protestation, report. But then I guess all reports are. If it stands a chance to be more than a report depends on the energy and motivation of those involved. This government, when it comes to libraries, has neither … so it will be up to the rest of us. Therefore, whether the Independent Report will have long-term positive effects I cannot tell – the future of this, and thus the public library service, is hanging by a thread. Golden or otherwise. I emailed Brian Ashley from the Arts Council about the grants thing (see my last post). His reply bears repeating in full. The fact remains there’s almost no money for this sort of thing normally so well done to ACE for supplying it in this instance. Other things to notice this week include the multitude of ideas coming in to Bristol as part of its consultation (you can rate other people’s ideas, which I think is excellent, even if some of the ideas are yeah … but …) and also the call from the York Mutual for members for its AGM. I don’t know enough about York for some reason – it doesn’t get the publicity of it’s southern counterpart Suffolk – but it’s striking its own path, which others may wish to follow. “The funding for the Grants for the arts programme is from the Arts Lottery and we are required to ensure that it is used to deliver arts based outcomes. This still allows for a broad range of activity to be supported. In particular we encourage library services to consider how they can work in partnerships with arts organisations to advance their broader objectives. With this fund the Arts Council has ring-fenced resources for applications that are led by library services which makes it easier for them to secure funds this way than is the case for our more general Grants for the arts programme. Having committed to this for the first three years since we took on the development agency role for libraries in England, we are pleased to sustain that commitment for a further three years. At a time when many library services have found it difficult to develop new activity, this scheme has been successful in animating library spaces in new and imaginative ways. We are very aware that library services face financial pressures across the full range of their role, and our other development funding is used more widely, for example by supporting the SCL Universal Offers and the work of The Reading Agency. Responsibility for funding and delivering libraries sits with local authorities, and our contribution is not there to directly address these wider funding pressures.” Brian Ashley, Director, Libraries, Arts Council England. Blackburn with Darwen – 3 libraries (Livesey, Mill Hill and Roman Road) under threat: will pass to volunteers or close. “This is not our Britpop anthem. This is dedicated to everyone trying to keep libraries open.” Manic Street Preachers at Roundhouse concert this week. So I did some calculations on the CIPFA figures yesterday (a national newspaper had emailed wanting some info – this sort of thing happens a lot: I had already helped Radio 4 earlier this week) and one thing jumped out. This is that there may be a decline in English public libraries but there is not in Wales, with the major difference between them – and I’m Welsh and living in England so I know of where I speak – is that Welsh budgets have been OK up until now while the English ones have been slashed. How slashed? Well, statistics are wonderful things but if you completely ignore inflation the minimum that English budgets are down is 18% since 2010 and, if you include inflation using the Bank of England calculator, then the most that they’re down is a whopping, a gigantic, 38.6%. Nearly two-fifths in four years? Let’s just be quiet for a second, contemplate the horror, and then move on (See this page for more statistical details). There are also other differences tooof course – Wales actually has Standards and a nationwide e-book/e-zine offer for instance – that will have made an impact but the key for my money is, well, the money. Let’s hope then that England becomes more like Wales, and not vice versa. Get those singing voices trained now, Limeys, because, trust me, I’ve been in enough English churches to know that generally you lot need the practice. One money thing that has stayed the same in England the last few years, and it has been announced will do so for another three years, is the Arts Council England grants for arts in public libraries. I’ve always been ambivalent about this. On the one hand, they’re a great resource for libraries to gain publicity and to encourage new audiences. On the other, well, it’s just plain strange to see often the same library authority announcing deep cuts and also some fancy arts library project in the same year and sometimes even in the same month. The challenge for libraries taking on these projects therefore should be to make them count. The time has gone, if it ever was here, where a service can get away with a nice feel-good project, employ a few artists, and then move on to the next grant. Monmouthshire – Abergavenny Library to move into One Stop Shop. North Ayrshire – cuts to library budget being considered. The announcement of deep cuts to the Library of Birmingham so soon after opening are shocking. Nothing shows the short-sighted nature of the supposedly long-term-focused austerity spending cuts than nearly having the opening hours of a £188m building opened the year before. This is a building that serves so many purposes – a haven for those to learn, an icon for the whole city and a tourist attraction – and yet now it will forever be associated with short-term idiocy. Naturally, everyone is blaming everyone else, with the current (Labour, not that it matters) administration blaming the previous one … and it is true that taking out such a large commitment just before the credit crunch is something that could only be done by an organisation that was, at the very least, engaged in boom-time groupthink. But, just think, at least they decided to build something as obviously useful as a library with the money. I’m hardly going to blame them for building something that will have such obvious benefits. If you’re going to choose a symbol for your city, there’s few better than a place of learning open to all. There are others, not in Birmingham, to blame as well for this mess. The BookSeller report says that the “oleaginous” (it means oily, apparently) libraries minister had the cheek, when it had nothing to do with him, to be at the opening ceremony last year. Despite his presence then, you can bet he is feeling very hand-off and localist about it now. But, really, he’s just one of a group, and no-one can accuse him of being a ring-leader. The blame also lies on all of those who think that cuts can be made to local government because they’re wasteful and lazy and that their cost outweighs their value. In actuality, what is wasteful, lazy, costly and valueless is thinking like that. Five years of cuts means there’s nothing left of that culture, if there was ever anything like it in the first place. Take all the credit you want for that, Mr Vaizey, but don’t think it hasn’t come without a tremendous amount of pain and hurt and, if you are hell-bent (and that is a very appropriate phrase) to go for more, don’t think it’ll be as easy (as it doubtless seemed from your nice chair in Whitehall) as the last five years. And don’t think the short-term savings you’re making now will make up for the long-term losses that cutting back on such value-giving services is going to involve. Correction I had originally included Council job losses blamed on government cuts – St Helen’s Star – as reporting cuts to St Helen’s. The real authority in question was Knowsley. My apologies for any inconvenience caused by this. Tim Coates has just sent me some figures from the most recent CIPFA library statistics. They show a lot of trends that one working in libraries can well believe: the first being the drastic drop in usage. Since 1997, we have seen a halving in book borrowing and a reduction of a third in the number of library visits. In the same time we have also seen the loss of two-fifths of professionally qualified staff (only two-fifths?) and a lost of a fifth of total staff. E-books are starting to make an appearance but are still at pathetically small levels, with total number of borrows being the same as New Zealand, which has one-twelfth of our population. So which came first the reductions in usage or the reductions in budgets? Tim disagrees with me and argues that budgets haven’t been much shrunk (he entirely disregards inflation) but everything I know, experience and has been told ties in with my view that the money has been cut by around a third over the last parliament. That alone could count for much of the reduction, as experience from the USA, Australia and New Zealand suggests usage is, unsurprisingly, far more buoyant in areas where spending has been protected. The problem with libraries, you see, is we cannot force people to use them – they’re a discretionary service and if people see the buildings looking tatty, with harried staff and not many books, well, they’re going to walk away. So a vicious circle is created. But there is more to it than that. The cuts in budget are masking and distracting library services and politicians from the massive change in people’s reading habits. Moreover, the fact that UK libraries are still experiencing such cuts in usage even in a time of recession when people should be wanting to use the free public library service more is as clear a pointer as anything that something is going on over and above cuts in investment. Technology is changing how people view libraries and, there, again, the UK library service is suffering more than elsewhere … because it takes pro-active planning and investment to transform a library service to what is more in keeping with today and such things are in short supply where all councils are doing is working out what to cut next. We can hope that the Sieghart Report (come on Mr Vaizey, you’ve paid for it, you publish it) can give a new impetus to providing that transformation because, left to themselves, 151 English library authorities are just not going to be up to the task. Like it or not, the current mantra of localism is inadequate for this task. We need national direction and we need it now. With thanks to Tim Coates who has crunched the numbers. My thoughts are in italics. The numbers of copies of e-books held in libraries in 2014 are England 526k; Wales 204k ; Scotland 60k; N Ireland 21k This is the same as New Zealand, which has one-twelfth the population. The number of libraries open 10 hours or more has fallen since 1997 by 9.8%. There are 4,282 library public services of all kinds in the UK of which 101 are reported as being not managed by their local council (2.4%). These are surprisingly low figures and suggest that not all volunteer libraries are reported as such by councils (my figures count far more, and are linked). 48% of libraries in the UK offer wifi. This is a shockingly low figure at a time where even bakers offer it. Capital Expenditure on public libraries in 2013/14 was the highest ever at £163m. If one takes inflation into account, it is not the highest – that was £161m in 2009/10. I also imagine a lot of this expenditure was to convert libraries to self-service or to install other services such as One Stop Shops. Council annual expenditure on library operations fell in 2013/14 by 2.8% to £940m (it was £967m in 2012/13). Inflation was 3% so the real fall was 5.8% if one takes that into account. Again, if inflation is taken at full face value, combined expenditure on libraries has fallen by a full third (33%) since its peak in 2005/6. See the figures using the Bank of England calculator. Expenditure on books (including ebooks and digital content) fell 14% to £77.6m, which is its lowest level for 20 years. It is 7.6% of library spend. There has been a sharp rise in property costs from 11.9% of expenditure to 13.5% in two years. It’s hard to see this as anything other than a budget grab by central council departments. In 2014 There are 19,307 paid staff of whom 3,106 are qualified professional. There are 35,813 (full time equivalent) volunteers. In 2007 there were 25,769 paid staff of whom 5,298 were qualified professional and there were 13,417 (full time equivalent) volunteers. This means that there has been a cut by a fifth of all paid staff in seven years, rising to two-fifths of professionally qualified staff. Volunteers have almost tripled in the same period. Somerset – Performing Arts Library may close. Well, it’s been a few days since my last post (due to illness) so there’s a bumper edition today. One of the advantages of this is that themes emerge – forests of new trends appear from the trees of individual news stories. So, looking down the page, we have problems with central libraries, competitive tendering, parish councils and the weirdly self-contradictory beacon of libraries as disaster relief. Let’s look at these one by one. I can see that the people of Cardiff are pretty darn peeved, not least because they stand the chance of losing their beautiful new-ish central library (what is it with Wales? Newport suggested the same thing last week) in order to stave off branch closures. The same Big New Shiny Expensive Library problem is also of cause haunting the biggest of them all – Birmingham – where barely two years after opening, they’re struggling to pay the bills. This ties in with another post from Will Self who compares the big libraries of the last few years with the Skyscraper Index, the theory that says that the biggest skyscrapers are always built at the peak of booms and open in the crashes. This theory actually ties in quite well, except that Mr Self then goes on to claim that libraries are not needed any more due to digitisation: something that will come as a shock to those who have had to push their way through the crowds at Liverpool, Birmingham or Manchester Central Libraries recently. No, the reason for the problem there is purely financial and whose blame lies with theory of Austerity than the illusionary theory that people don’t use big libraries any more. Something that has been expected for a while has finally happened: the acceptance (in large part forced by a judicial review) by Lincolnshire that GLL has put in an eligible bid for its service has meant that its service is now open to tender. This has always been a worry with this: that a socially acceptable mutual or trust could be used as a stalking horse for their darker kin, for-profit companies, to get into markets otherwise closed to them. Lincolnshire looks like it’s going to be a test case for this so it will be interesting what happens in 2015: campaigners may think twice about judicial reviews if they are then see Carillion making 5-10% profit at the taxpayer’s expense two years later. Not that that, private companies would argue, is necessarily a problem – their claimed efficiencies and economies of scale have been used to justify the profit – but few waving placards outside a threatened branch can be doing so in the hope that it would help shareholders. There’s a fair few protests in North Yorkshire and elsewhere at the decision to push yet more libraries onto volunteers. The perceived success of the first few waves has led to more and more areas being given the Hobson’s Choice of volunteering or closing. One wonders, though, if the low hanging fruit here has already been picked. Branches in prosperous socially cohesive Buckinghamshire villages may be able to sustain volunteer libraries but is there a stage where libraries are just too big for this treatment? Also, some parish councils are getting a little uppity about their larger country brethren suggesting that they take over the task of running branches. The principle of double taxation has been raised. As the larger councils push more and more onto the smaller, at some stage the elastic is going to snap … and we may be already reaching that with some. Finally, a word of praise for Ferguson Library in the USA. This branch, with a clearly inspirational new library manager, has coped so well with the riots there that it has become a beacon of peace in what is clearly a community in danger of breaking. This role of the library as disaster relief is a common one in America: Hurricane Sandy led to many libraries being used as emergency centres. It’s not something, thankfully, that I have seen the need for British libraries to do but the possibility is there. So make sure that libraries are included in your council’s disaster management protocols and get another feather in your library survival bow. Lincolnshire – Libraries will be put out to tender, following acceptance GLL bid meets criteria. Ice cream carts for books. See also this. Library pig – micro-pig used as mascot and as reading therapy.